If you deal with arthritis in your knee or knees, join the club! This study indicates that 10% of the men and 13% of the women over 60 are suffering with the most common joint problem in the US — Osteoarthritis. And I can assure you that you don’t have to be 60 to need the best knee support for arthritis. Even though osteoarthritis is in general a condition from long term wear and tear, many of us are much less that 60 when it first appears. I’m sure you know all too well the symptoms of arthritis, but did you know that the #1 treatment for arthritis in your knees is exercise? The problem is that exercise can be a real pain in the knee when you walk, much less exercise? What if I told you there’s a way to exercise, walk, and be active with arthritis – with much less pain? As it turns out knee sleeves give me the support I need to stay active and do most anything I want to do — with arthritis. How Does Knee Support for Arthritis Work? Will Knee Support Sleeves Help? What Can You Do For Arthritic Knees? With arthritis in my knee the knee pain is raw some days, swollen and sore on other days, and then there are those days that my knee feels like it could collapse at any moment? If you’re like me, you hate having to say no to activities you love and you dislike the constant medication it takes to keep going at the pace I need to go . To tell you the truth, I am really just not up for knee replacement surgery yet. So, the day came when I started looking around for alternatives to knee surgery for arthritic knees. It didn’t take long to realize that people were using knee sleeves for support and pain relief. But hey, there’s a lot of options out there, and do they really work? Would I fare better with an open patella knee sleeve, a full slip on sleeve, a brace with Velcro straps, one made from fabric or neoprene. And what’s with the 3mm, 5mm, or 7mm sleeves? 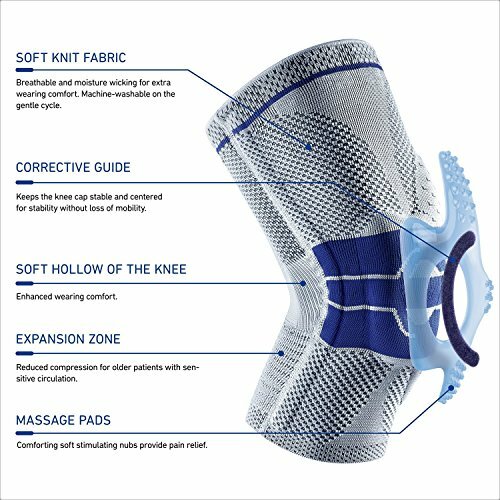 Like most newcomers to knee support, I had a difficult time trying to discern which brand was a name brand and reliable, and which were “knockoffs” that would soon fall apart with no guarantee? There’s so many choices when it comes to knee support these days, that it’s mind boggling. My conclusion is that most any knee support brace is better than none, but some are significantly better than others. Part of that hinges on the fact that different knee sleeves and different models are simply designed for different purposes. Over the last few years I’ve used and reviewed several different knee support sleeves to brace up my knees and allow me to stay as active as I like. I’ve discovered that quite a few are nothing but junk and knockoffs made for the sole purpose of retrieving our money? On the other hand, there are knee support brands that will give you a new lease on life. Some are designed specifically with arthritis in mind, and others are more multi-functional, but work well. I must confess, that until I began to deal with sore and painful knees, I little considered life without them. The truth is though, that your knees are rather complicated joints designed to keep you stable as you stand, move, walk, twist, jump, run — you know — stay mobile, active, and pain free. Osteoarthritis of your knees is mostly a condition caused from wear and tear. Sometimes it’s just normal wear and tear. And some of us have put enormous stress and strain on our knees in work or sports, that started the wear early. In both cases, when it comes to osteoarthritis it’s the cartilage that wears out and we start having pain and problems. The most common symptoms of Osteoarthritis are what you already know: Soreness, joint pain, sometimes inflammation, a feeling that your knees will give way, and often a lack of balance. The cartilage is the cushion between your femur (thigh bone) and the tibia (shin bone). It is a shock absorber for the joint, and keeps the bones from actually touching each other and rubbing together. As it wears out the bones — ligaments, and muscles start to get out of alignment. Now everything remotely connected to your knee starts to pay the price and you know it with pain and your knee feeling like it may buckle. As you may know, there’s no real cure for arthritis in your knees or anywhere else. You can get steroid shots in the joint to help reduce and hold at bay the inflammation every couple of months. The only real cure is to replace the joint or sometimes the cartilage itself. I have found along with many other folks that knee compression support sleeves can really keep you on our feet and enjoying life without all of that. The elastic, or compression, of the sleeve itself can help with holding all the muscles and the bones in better alignment and add much needed support. The tightness of the compression around the joint helps you stand straight when you put your weight on it, and provides confidence that it won’t buckle, or collapse under your weight. The compression increases the blood flow to the joint and affected areas which will in turn provide a soothing warmth and help dispel the inflammation that plays such a great part in Osteoarthritis. By all means! Even though they won’t heal the joint, they will give a lot of relief from the symptoms. And it is the symptoms of arthritis that’s my real concern, right? A good knee sleeve will promote blood circulation, reduce the pain, inflammation, swelling and muscle fatigue that is always part of arthritis in knee joints. Exercise always seems to be completely counterintuitive to the condition. However It’s exercise that you need! With regular exercise you will keep the full range of motion and strengthen all the muscles supporting your knee. Keeping the muscles strong will help take a lot of the pressure off the joint itself. If you stop your normal walking and daily activity due to the pain of arthritis, muscles and tendons will quickly begin to shorten and the pain becomes even worse. The more you sit without exercise, the more pain, swelling, and soreness you will experience. Whether it’s prescription painkillers, or over the counter medicines, taking so many is detrimental to other parts of your body. Regular exercise and premium knee support will get you on your feet, exercising, going where you want to go, doing what you want to do — without so much medication. You may need complete knee replacement to get back to lifestyle you want? On the other hand, knee surgery is usually a difficult surgery to get over, and like any surgery, it comes with risk. There’s plenty of people, including myself, that put off knee surgery with a quality knee sleeve that gives me the support I need to stay as active as I like. I’ve found that exercise, quality glucosamine supplements, and knee support from knee sleeves is the answer. Not all knee support is designed for Arthritis. I’m going to show you two of my absolute favorite knee sleeves for arthritis and tell you a little about each one. I hope you will read these two reviews and give one of them a try because they could really make a difference in your life. These two knee support systems are designed different and have a very wide price difference, yet both are extremely reliable products. When you take your knees, arthritis, and knee pain seriously — Bauerfiend is the support you want and need. I’m going to let you know up front that this is a very high end sleeve and cost more than other common brands. But what you get is awesome knee support for Arthritis and chronic pain with this fabric sleeve. This Bauerfeind A3 knee brace has been designed specifically for people with knee pain from degenerative knee pain — namely osteoarthritis. The fabric is made for conforming to the shape of your knee to keep it mobile, stable, and supported. You can see in the image a pad inside the fabric to keep your kneecap from moving around. The Bauerfeind A3 brace pad is also designed and engineered to intermittently massage your knee and muscles as you move. This is a medical grade device that delivers just the right amount of compression for enhanced blood circulation, pain relief, and fatigue. Made from a soft knit fabric that’s stretchy and machine washable. Maintains its elasticity, resilience, and flexibility to keep on giving you just the right amount of compression and pressure for years. Breathable fabric to help wick away moisture from your knee. Bauerfeind prices can’t really be compared to other products because it’s hard to compare other Knee support to what Bauerfeind produces. If you’ve been walking on sore and painful knees the A3 can make you think you’ve been healed? It will help you immediately with your pain level, stability, and balance. This is a product with features other knee sleeves do not have, and this is what sets it apart from the competition. Wash it on gentle cycle with no worries of it changing shape or losing the value of the medical-grade compression. The sleeve is comfortable to wear all day and can be worn “almost” inconspicuously under clothing. Do yoga, walk the mall, run the track, go up and down your stairs pain free with the confidence that your knee is good hands. 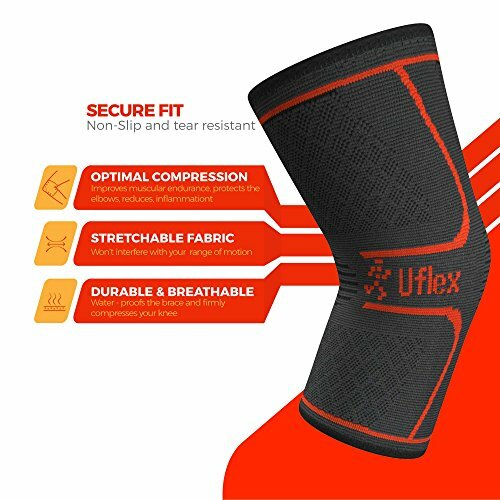 Uflex is another of my favorite knee sleeves that works for arthritis, running, jogging, exercise, workouts at the gym, pain relief and more. Uflex Knee Compression Sleeves always come with my highest approval rating. Even though they are on the other end of the price scale from Bauerfeind, UFlex is a great product with great reviews. 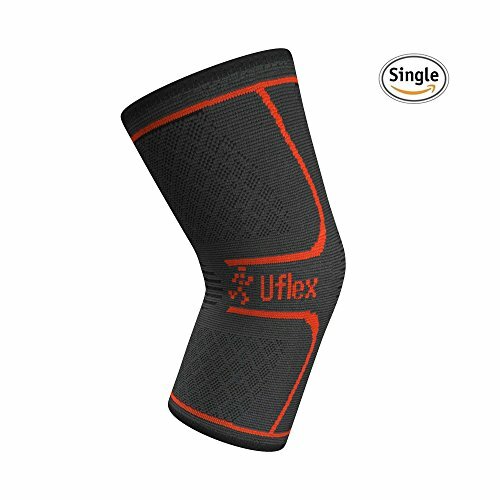 Uflex knee support sleeves are some of the most reliable and versatile support sleeves I’ve used. 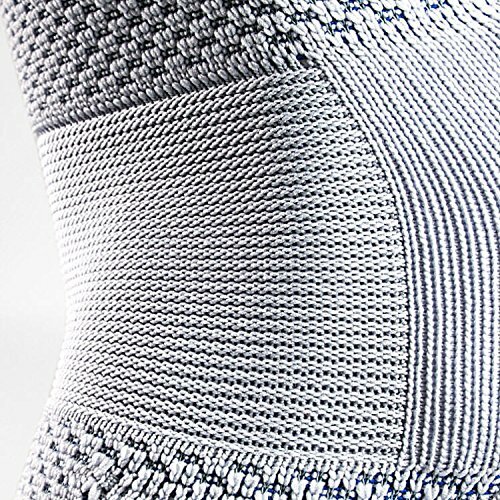 It gives me the compression I need to support my knee as the stretchable knit fabric keeps it warm with a full range of motion. It’s been great for hiking, exercising, bicycling, and keeping me active and on the go. When it comes to knee support sleeves for arthritis, I much prefer knit cloth to the more rigid neoprene sleeves. Even though there are plenty of good knee sleeves to provide the compression, support, pain relief, and the chance for me to be as active as I want, I really like Uflex. They are comfortable, provide everything I need from a knee sleeve, and are priced for most anyone to afford. With Uflex I know I am dealing with a company with great support, and they give me confidence in knowing I am protecting my knee from injury as I stay active and avoid knee replacement surgery for as long as possible. Knee support of any kind when you are dealing with Osteoarthritis can help you get around pain free or with substantially less pain. Knee sleeves can give you the ability to walk further, and get the exercise you must have to keep an arthritic knee mobile. Unfortunately for us, cartilage has no ability to repair itself when it breaks down like other parts of our body. A knee sleeve can really make life with arthritis more bearable, and you can continue the lifestyle you love. Can I guarantee these for you? 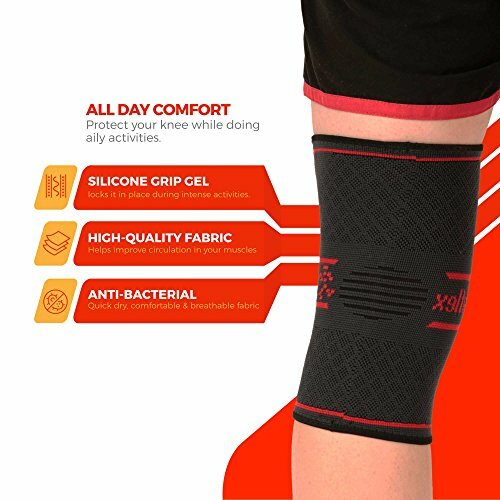 If you read the reviews here, you will see that the majority of the people who purchase a knee support sleeve really love them and get plenty of use from them. On the other hand, there will always be a small group of people who would find something wrong with free money? Choose one you like the looks of, be absolutely sure you follow the directions on how to measure for size for that particular brand, and buy the thing. It’s not going to be a miracle, even though it could seem like one. You can almost be assured that there will be some benefit to wearing a knee sleeve. If you never try any knee support for arthritis, you will merely hobble through life without knowing! If you are overweight, lose it! Thanks to the knee support I get from knee sleeves for arthritis, I’m relatively pain free now. I walk, run, exercise, and workout along with all the other regular activities of life with little regard for arthritis in my knees. Because we all have different ideas of what makes the best, I’ve introduced you to one great knee sleeve on each end of the price spectrum. Now it’s up to you to decide if you would rather suffer on and wonder if it would help your arthritis, or give one of them a try? If you’re on the fence about which one is really the best knee support for arthritis — try this less expensive one first. I am sure you will love it. 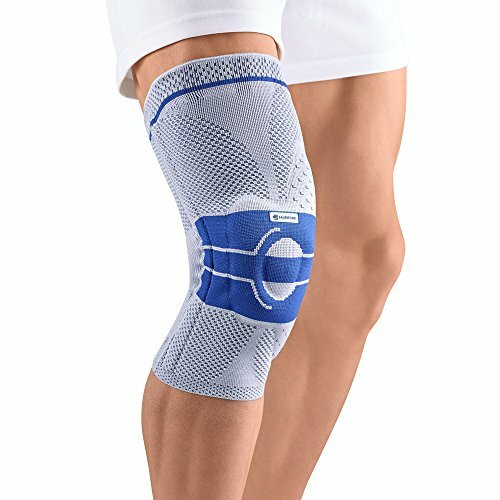 Do Knee Sleeves Help Arthritis?